That was something like the question Matthew Parsons asked Nick Sykes and I as we drove back from the final round of the Calderdale Congress just over a month ago. Matthew was, of course, trying to be helpful and draw some lessons from a full on weekend where we had all played 15-odd hours of chess. We were pretty frazzled and couldn’t come up with much of a coherent answer. 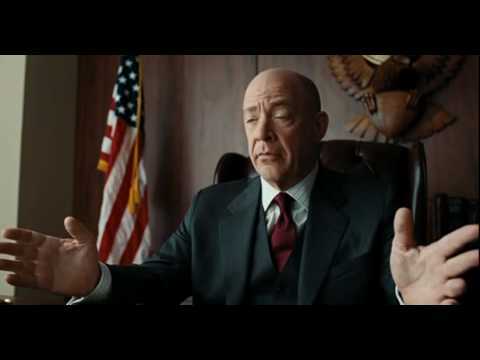 It reminded me strongly of an amusing exchange at the end of the film ‘Burn After Reading’ where two confused CIA officers sift through the wreckage of the farce that has gone before, desperately trying to make sense of it. CIA Superior: What did we learn Palmer? CIA Superior: I don’t [blooming] know either. I guess we learned not to do it again. CIA Officer: Yes, sir, it’s, uh, hard to say. It’s a very funny film and well worth watching if you haven’t seen it. This game (right) was played in the recently concluded Norway Chess 2015. In this position, having defended tenaciously for quite some time, White simply needed to find the reasonably straightforward 74.f5 gxf5 75.Ke5 in order to exchange off the last Black pawns and guarantee a draw. Tragically, he played 74.Kc6?? and when his opponent replied with 74…Ke6 he released his error and had to resign at once. In the post-mortem interview after the game Topalov accounted for his opponent’s lapse by suggesting that White had anticipated that Black would play 73…Bb8 after which 74.Kc6 is indeed the best move. That sounds plausible but it’s still a pretty terrible mistake to essentially play a move without even consciously registering what your opponent has just played!Even more extraordinarily, this was not the first point that Veselin Topalov had ‘donated’ to him by a Norwegian in that tournament. The World Champion, Magnus Carlsen, arrived a little late for his round 1 game with the Bulgarian and missed the arbiter’s introductory talk explaining the various time controls before the clocks were started. Consequently, when he got to move 60 he thought that he would get 15 minutes added to his clock and sat thinking about how best to convert his winning advantage in a queen and pawn ending. However, Magnus had a rude surprise in store because he did not in fact get more time added to his clock and was instead obliged to play on increments of 30 seconds per move. Consequently he over-stepped the time limit and lost. It was a result that upset his equilibrium for three or four more rounds after this one as he started with only ½ out of 4! So, even the World Champion is not immune to making elementary mistakes that cost him dearly. However, the Hammer example is one that more of us can probably identify with and it just goes to show what six hours of intense concentration can do to your brain. Even the simplest tasks become terribly difficult. For us chess mortals it doesn’t take anything like six hours for this kind of hypoxia-effect to take hold. At Calderdale for example in my last round game my opponent and I had been playing for barely three hours (though it was the second game of the day!) when we reached the position on the right. White had absorbed a significant amount of pressure during the middle-game and early endgame and has reaped the reward for his resilience because I had lost the thread of the position and now found myself in a hopeless situation. Only my willingness to try and help my club colleague get a share of second/third prize (by salvaging a draw) prevented me from resigning. However at this point I saw that, if White naturally enough elected to exchange off the knights on g5, it was possible for him to then play inaccurately and give me a chance to hold. So, White did indeed play 56.Ng5+ (there were many other winning moves but this is still sufficient) Nxg5 57.hxg5 a6 and now White needs to play precisely to win the game. For example, I had seen that if 58.Kc5? then b5 comes and Black will liquidate the queen’s side pawns and then capture the doubled g-pawns to hold the draw. The correct response is 58.a5! 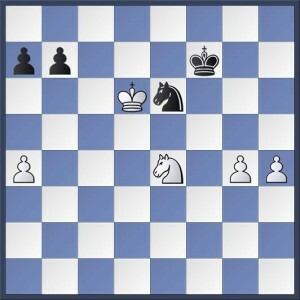 after which White can capture en passant if 58…b5 comes and so White wins. What I could scarcely have imagined was that my opponent would play 58.Kc7?? which actually loses to the same pawn advance. After 58…b5 White is lost. Did I deserve this win and the accompanying prize money that I had now swindled from my club colleague? No, of course not, but chess is not a just game. Only in the previous round I myself had made a similarly catastrophic over sight in a king and pawn ending, but I had escaped with a draw. On the right is the position close to the end of the game with Nick Sykes (which is well worth playing through in its entirety because it’s extremely interesting). I had just acquiesced to exchange rooks on d2 thinking that the resultant king and pawn ending was at worst drawn. However, this was based on me simply counting the moves that it would take for both I and my opponent to queen a pawn. After 42.b4 Kc3 43.Kf4 Kb3 44.Kg5 Kxa3 45.Kh6 Kxb4 46.Kxh7 Nick chose to queen his a-pawn by continuing with 46…a5. This is just as quick as moving the king and queening the b-pawn but there is a crucial difference because, what both of us had overlooked, was that the b-pawn queens with check and then Black can force the exchange of the White queen and win the game with his remaining a-pawn! OK, so this example is slightly more difficult to spot and calculate compared to the previous example. Especially from the point at which I had to decide on whether or not to exchange the rooks. What it does illustrate though is that in concrete positions like king and pawn endings, it’s vital to calculate accurately and look beyond the move that you think is the ‘last one’ in the variation because it may turn out not to be the case! In king and pawn endings finding the correct method of proceeding is absolutely imperative as any mistake is usually terminal. Sadly, Pete learned this lesson to his great cost in the very first round as he, having obtained the winning king and pawn ending below, stumbled almost as he was crossing the finishing line. 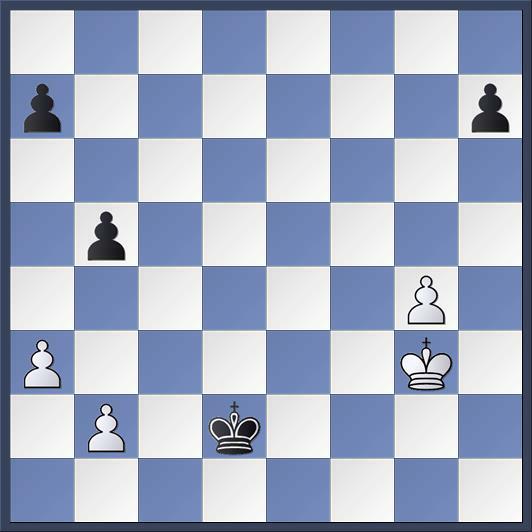 In the last of the diagrams in today’s post (right), Black has just played 45…Kb2 and here the same ‘counting-the-moves’ technique mentioned above is relatively straightforward. It will take four moves for White to queen a pawn f5-f6-f7-f8=Q whilst it will take Black six moves Kxa2-Kxb3-a4-a3-a2-a1=Q. That calculation should be enough to have any player stop ‘thinking’ and start blitzing out the remaining moves. But on this occasion, agonisingly for the kibitzers willing Pete on, he suffered an aberration and thought he needed to follow the Black king to the queen’s side. Then after 46.Kd3?? Kxa2 47.Kc2? a4 he realised that he couldn’t stop Black from queening and no longer had time even to run his f-pawn. This was a traumatising defeat on the Friday night which Pete struggled to recover from. His opponent meanwhile went on to beat Dave Shapland in round 2, Nick Sykes in round 3 and then drew with ex-Hebden player Dave Sugden in round 4 on his way to winning the section. Ok, so that’s enough of the ‘epic fails’ let’s consider some of the more positive aspects of the congress. In the Major Nick Sykes played a very nice game indeed on Saturday morning to crush Mike Connor with some considerable ease without it ever being really all that clear what Black had done wrong. Besides this, as mentioned earlier, his draw with me in round 4 was very interesting and unusual. Both these games are annotated by Nick in the game viewer at the end of this post and I’ve has also annotated the same game so if you are really keen you can see what each player was thinking as the game progressed. I had an unusual weekend because I managed somehow to avoid castling in all of my first four games! In the first two rounds this was quite voluntary and probably rather dubious in each case. In round three my opponent unleashed a combination on f7 which forced a recapture with the king and finally in round 4 the game went into a queen-less middle game where castling was not so important. The round 1 game is certainly worth looking at on the sole basis that it is quite interesting. Pete recovered from his tough round 1 defeat to bounce back in round 2. Sadly he had another set-back in round 3 before closing the tournament out with two draws. Interestingly, there were no White wins in all five of Pete’s games. Pete has been kind enough to send us all of his annotated games (as has Nick) and I’d recommend that readers take a look at some of the interesting variations that appear in the round 4 match-up. Matthew Parsons played in the Open Section and seemed not to suffer from any of the kinds of tribulations the rest of us experienced. He too has sent us his games and he had a good weekend where he was always in contention for the top prize, winning some nice games along the way. Sadly, his run came to an end against John Surtees in the final round but Matthew acquitted himself very well even in this game and enjoyed playing it despite the result. Three points was still enough for joint second place. Calderdale was a sharp reminder for me that congress chess is very different from evening league chess. The games are longer, generally tighter and because every individual results matters, it’s more stressful. The ending is the phase of a chess game that demands the highest level of precision and yet it is the phase of the game that you have to execute when you are most fatigued âˆ’ therefore expect mistakes to happen. 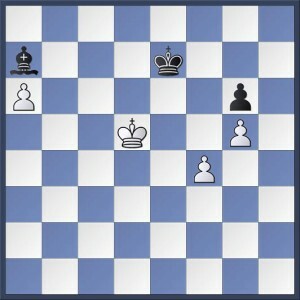 Even though calculation is vitally important in chess endings, having a plan is also crucial. If you can figure out how to achieve your objectives then you can sharpen the focus of your calculations towards the winning method. Just because you played most of the game to a good standard, doesn’t mean that you’ll win (or even deserve to win) the game. Above all we learnt that, whatever it was we did, not to do it again! 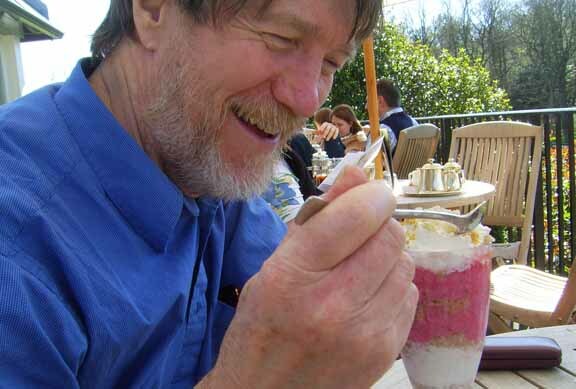 for HBCC: an ice cream sundae before every match! ï»¿ï»¿ Today’s post comes courtesy of “T.M.W.D.W.M.T” (a.k.a. Pete Leonard). Who took part in the Jorvik Chess Congress in York back at the beginning of this month. Pete has been through all his games and annotated them so my thanks go to him for taking the time to prepare this report for us. “Intermezzo was not the only person to have entered a chess tournament this summer, though my choice was a much less prestigious affair than the British Championships. However, I followed similar reasoning to his, when I saw the flyers for this event at the HBCC. We have friends who live in York, so I could stay with them and have a pleasant walk to and from the hotel each day. This congress is in its second year. According to the organiser, Peter Cloudsdale, he had just ten entries last year; this time there were 34, which is a healthy increase. We were divided into two sections: A for those graded above 130 and B for those on 130 or below. A five round Swiss would suffice for such numbers, but I didn’t have his problems of managing the draw, so could simply enjoy an extra game for my entry fee. Unlike the British Championships, the time allowance was quite short: just an hour apiece for the entire game. As my first game lasted over 60 moves, that was quicker than a minute a move! My target was to achieve a 50% score overall; not unreasonable, as my grade placed me pretty well in the middle, between a highest of 187 and a lowest of 131. I should be disappointed with less than 3/6 and pleased with more. Everyone else was a stranger to me; in the first round, I drew White against Eric Key. A pleasant chap, I think we both had similar ambitions: to play as well as we could but chiefly to enjoy the experience. He confessed to not having touched a piece in anger for four months; together with my lack of match practice, this probably accounts for the less than perfect, though close, game. So, I won each morning with White and lost each afternoon with Black. It must be my age; I’m missing my afternoon nap! Still, I can take satisfaction from the fact that I achieved my target and could even have had 3½ or 4/6. ï»¿Today’s post comes courtesy of Hebden Bridge Chess Club’s highest graded player, Matthew Parsons. In a post from earlier this week we covered off his successes at the Huddersfield Rapidplay and the Club Lightning competition but Matthew had started his warm up routine for the new league season even earlier as he explains below. Over the Bank Holiday weekend in August I played in the Major Section (Under 170) at Leyland Chess Congress. With my ECF grade of 167 taking preference over my YCA (174), which would have placed me in the Open, I could have expected to be one of the favourites for the 1st prize. There were two other players with the same grade as me and one higher, Abigail Pritchard, who was graded 168. She, like myself, did not have the best tournament. I finished on 3.5/6, with 3 wins, 2 defeats, and 1 draw. As you will see from the games below, the 2 defeats were nothing to do with my opponent beating me, but rather foolish errors from myself. In round 1 I over-pressed against a weaker opponent, searching too hard for a win, only to blunder in time trouble and lose. In round 4 I had a totally won ending which I messed up in terrific style. My play was sporadically good, but I was definitely very rusty having not played over the board since March, where as many of the other players in the tournament had played in various sections at the British Championships in Sheffield earlier in the month. I also found myself exhausted each day, much more so than normal. That said, it was a good warm up for the league season and hopefully any rustiness is now out of my system. In fact I finished 2nd at the Huddersfield Rapidplay Open Section last weekend, beating the top seed Peter Shaw in round 1 in the process, a player graded over 200. My play on this day was at another level to how I played at Leyland. Here are the games from Leyland with my own annotations. My thanks go to Matthew for taking the time to provide this report and annotated games to us. I hope that other players will find his thoughts enlightening and entertaining. The Calderdale League season begins next Monday the 19th of September with all four of the club’s teams in action as both leagues 1 and 2 kick off. A full list of the season’s fixture can be found on the new Calderdale League website and all fixtures pertinent to Hebden Bridge teams can be found by visiting the “Calderdale League Fixtures 2011-12” page on this site. I’ve been reflecting further on my recent experience at the British Championships and in particular thinking about the attributes required to be successful as a chess player. By ‘successful’ I don’t just mean winning the odd game in the league but winning tournaments and league titles on a regular basis. In Sheffield I experienced first hand the levels of determination and fighting spirit that were required to carry me as far as the top board of my section in the final round. I had to play some of the best chess of my life to do it. I also needed to capitalise on the odd bit of good fortune and some bad mistakes from opponents at crucial moments. But, I’d say more than anything else, I found it essential to consciously collect together my reserves of will power and determination before every game in a way that I wouldn’t normally do before a league match. This was the first occasion on which I had asked myself to play two games a day for 5 days and I found that maintaining the necessary level of intensity was the most challenging and exhausting aspect of the whole experience. It made me realise what it must take for the professionals to compete successfully at the highest levels. Last week I was interested to hear the thoughts of Michaels Adams who won the Championship after a play off with Nigel Short. He was pretty open about saying that had didn’t think he’d had a particularly good tournament. I’ve edited this quote from an interview Adams gave to “The Full English Breakfast” podcast (well worth subscribing to by the way) shortly after his victory. Adams clearly felt like he’d had to work very hard for his victory and also mentioned that he’d had to save a few desperate situations, particularly against his closest rivals, Short, David Howell and Gawain Jones. Despite this he still emerged the winner and that was in no small part due to his resilience and strength of character. Adams may have thought Short had played a better tournament but it wasn’t enough to take the title off him. 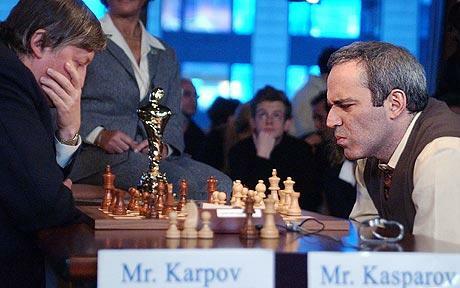 Of course Garry Kasparov was the arch competitor and made his will and determination physically manifest during play. Having seen video footage of Kasparov in action it is fascinating to see how expressive and energised he was at the board. It’s as if he simply couldn’t restrain his strength of character from seeping out. I’m pretty sure that will to win gave him an extra 10% against even the most talented opponents and may even have seen him through the tightest situations against Karpov, who was himself an iron-willed competitor. So, maybe there is a lesson for me in all this. I need to try and find a way of bringing the intensity I found at the British Championships to my play in the coming league season. If I can succeed in doing this consistently then I think I can be confident that I will play to the best of my abilities and that my results will improve further in 2011-12. Now I just need the discipline to apply what I’ve learned game after game. That’s always the hard part! The boards and clocks have been packed away and the players have returned home weary and battle scarred after (for those in the Open anyway) two weeks of exhausting action at Sheffield Pond’s Forge. Sadly, I’m one of a small number of players who will have left feeling slightly traumatised by falling at the final hurdle. I couldn’t write a diary post last Friday because the emotions were all still a bit too fresh. Readers will gather from this that, having worked so hard to get to 3½/4, I lost in my final round game in the Under 160 Championship. All I can say is that a simple straightforward loss would have been easy to take than what actually happened. On Friday morning I found myself pitted against Roger Greatorex on the top board with an opportunity to take the title. I gathered that my opponent was a seasoned weekend congress veteran and I imagined that he would play solidly with the White pieces. This turned out to be the case as he deployed the Torre Attack against me. Normally this is the kind of opening that I’d just set myself up for in a solid fashion and accept a draw if my opponent decided to behave peaceably. 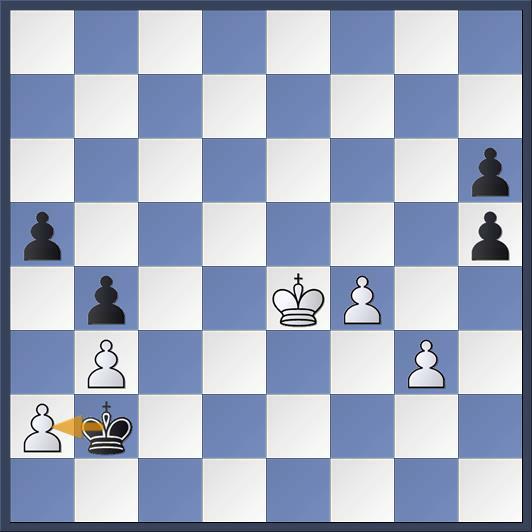 I couldn’t afford to do that here so I tried to organise my play in a slightly more dynamic fashion by allowing him to double my f-pawns and then later exchanging my d-pawn for his c-pawn in order to open the centre and try and create an environment where I would get some winning chances. You will see from the game below that I succeeded in my efforts and in fact my opponent seemed to get a little frustrated and struck out on the king’s side in a fashion that left him weakened there in the longer term. I was able to repel his sortie and then took the initiative eventually winning a pawn and then getting to a pleasant endgame. I got into a little time trouble again but handled it sensibly to reach time control at move 40 and felt confident enough in my position to decline a draw offer from my opponent even though it appeared it would be difficult to break through in a blocked position. I found a way to achieve the break through and forced him to give up his remaining rook when I queened on f1. That should have been it. Game over. I had a rook against his two connected passed pawns and enough pawns of my own to be able to sacrifice this piece if I needed to and still win. But that’s when it all went wrong. I was struggling with the clock again and after nearly 4 hours play the exertions of the week finally caught up with me. I couldn’t find the right plan and my opponent managed to get both his d and e pawns to the seventh rank. The game was up. To make matters worse, as we were pretty much the last game to finish, I had a host of kibitzers demonstrating for me just how I could have won the end game in straight forward fashion. That was that then. Off I sloped, feeling too sick with myself to eat anything before the final game of the second competition I had entered that afternoon. The last thing I felt like was playing another long game of chess but in the end I decided that I had to get back on the horse and try and win my last game so that I could leave Sheffield with the taste of victory in my mouth. I at least succeeded in this regard as I managed to win another game with my Classical Spanish. This game is also featured in the viewer below. I was at least in good company in my disappointment. Nigel Short tied with Michael Adams in the Championship itself after 11 rounds had failed to separate them by more than half a point at any stage and they had drawn their individual encounter. This meant they had to play off for the title on Saturday morning with two rapidplay games which Adams won by 1½-½. Short must have felt even more disconsolate than I after that. There must also have been other players who tasted bitter defeat in the final rounds of their competitions. For those of you who are looking for some slightly better quality games to digest than those of mine above then I can heartily recommend the bite sized chunks you’ll find on Andrew Martin’s “Game of the Day” pages on the Championship website. These are expertly annotated and very instructive. For a married man like me, justifying the use of a whole week of annual leave to go and play chess is a big deal. Fortunately this year I have 5 days more annual leave to take than my wife, the British Chess Championship is taking place in Sheffield where my folks live and I’ve not played any weekend chess this year apart from the Brighouse Quickplay. I’ve built up a solid justification for playing in the British Championships this week then but it does make me think how much harder it must be for a chess player with a family to take part in this contest. Usually, the Championships take place at a coastal destination in order to give the families of chess players something to do whilst they are feeding their addiction at the board. This year I think it unlikely that many competitors will have found it easy to persuade their nearest and dearest that a week (or even two!) in Sheffield was an enticing vacation prospect. Still I can’t complain as there is no way I would have wanted to spend the money on a week’s accommodation so being able to stay with friends and family is what’s enabled me to take part this time around. Vera and Vladimir at play! This is from Stacy Schiff’s biography of VÃ¨ra Nabakov which is titled VÃ¨ra (Mrs Vladimir Nabokov) – Portrait of a marriage. KrabbÃ© also posts the picture I’ve put into this post of the happy couple studying together. What fortitude this lady showed in the face of chess widowhood! 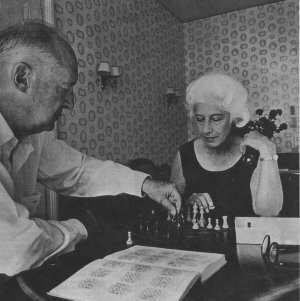 Perhaps Duchamp also harboured dreams of enticing his wife into the study of rook and pawn endings. I think Alex Ferguson would have called yesterday at the British Chess Championships “squeeky bum time” as the penultimate rounds took place in all competitions. Do not let appearances deceive you. Kevin Winter was a very resiliant opponent! It was all on the line in the Under 160 section in the morning where I had to win with White to give myself a shot at the title on Friday. I played against Kevin Winter who is seasoned weekend player and I knew he’d be hard to break down. That was exactly how it was as he played a closed variation of the French Tarrasch (1.e4 e6 2.d4 d5 3.Nd2 Nf6 4.e5 Nfd7). This opening has been kind to me and it was again as I played actively but solidly and managed to build a big positional advantage on the back of only a couple of small inaccuracies from Kevin. Eventually I won a pawn but once again I had used a lot of time to get into that situation and was left with only 6 minutes for my last 10 moves. Kevin sensibly went in for complications and so I was very pleased to have been able to refute his play despite my time shortage. The critical moment in the game came on move 29 when Black played Qh3, threatening my pinned knight on e6. I then found 30.Ng5 after which Qh6 runs into a pretty combination and so Kevin was forced to swap off the queens. He then fell into a little trap so that I was able to pick up an extra piece. Job done! The game is in the viewer at the end of this post. So I now face Roger Greatorex on Friday morning for my chance to win the title. He and I and one other have 3.5 points so it’s still all to play for. Having put myself in contention in the Under 160 the last thing I needed in the afternoon was a long drawn out struggle in the Open competition where a defeat and a draw had already put me out of contention. I had drawn another very strong player in the form of Raymond Wynarczyk (178) from Tyneside. I decided not to commit myself 100% to the game but to nevertheless have a go. He played a Sicilian Defence and confused me a bit with the move order. I tried to steer the position towards a sort of Classical Schevenigan and managed to do so but with some important differences. Raymond defended my desperado attack very accurately and in the end I was losing my queen. The game is also in the viewer below. The game was over in 3 hours but it was exciting enough to merit some analysis and I didn’t want to miss the chance to pick the brains of such a good player so we had an enjoyable 45 minutes or so of analysis which was really useful for me. Thanks to Raymond for being so generous with his time. After that I decided to go to the gym for an hour to let off some steam and left Pond’s Forge feeling energised for action on Friday! A really tough day today and I left Pond’s Forge feeling totally hollow despite having picked up a point and a half. The fact of the matter is that I stole my points today and made some bad mistakes that I was fortunate to avoid being punished for. On the plus side I’ve successfully negoatiated two more games with Black and my reasonable level of physical fitness was, I believe, a major factor in my success today. I managed to outlast two opponents over a total of 9 hours of play and benefited from tired mistakes at the end of epic struggles! In the morning I played Graeme McCormick of Northern Ireland. He arrived 20 minutes late for the start of the game (a fateful error as it turned out) and we got down to business in a Classical Spanish (3…Bc5). He played 4.c3 and I decided to be brave and venture the Cordel Gambit 4…f5!? Objectively it’s a bit dubious but, as with so many gambits, it’s hard to meet over the board and I got a great position in the middle game as he played a series of inaccurate moves. Looking at the game tonight was a bit depressing though as I overlooked a simple trick to win a pawn early on and he then missed a golden opportunity to win a piece! I applied great pressure in the middle game but, in trying to find the best moves to put him under pressure I strated to chew up clock time and in the end I had to rush my last 7 or 8 moves at a critical point in the game and missed what would have been a very beautiful conclusion to the game (though it was hard to see even with lots of time) in the form of 38…Qe6!! After this epic encounter I found it hard to get motivated for the afternoon game. Especially as I was playing Alexander Freeland again (I played him in round one of the U160) and was already out of contention for the prizes. We both played the opening casually and he avoided the theory books this time. Again there were lots of errors. He won a pawn and I failed to spot that I cold win it back immediately with 16…Nb4. Then things got tough as I desperately sought counterplay. I was pleased with my plan to get two connected pawns in the centre of the board but he should have been winning with his queen’s side passers and made a pigs ear of it. At the end after 5 long hours (surely I must now be a candidate for my own “Obduracy Award”) my resiliance paid off when he made a terrible error (my last throw of the dice) with 68.Kb7?? and the game was drawn! Well readers, I promised you a Championship diary and by jingos you shall have one! I had hoped to post every day but after travelling to and from Sheffield from Hebden Bridge yesterday (as well as playing for 8 hours!) I just didn’t have the energy last night. Tonight, and for the rest of the week, I’m staying with family and friends and so I’ll have the opportunity to tell my story and give you the news. Before I dive into the action some general thoughts. The British Chess Championships is being held at Pond’s Forge in Sheffield this year and there have been around 1,000 entries across the range of competitions taking place across the fortnight’s competition. The venue itself is pretty good. My only minor compliant would be that it is far too hot in the sports hall. For such a big room capable of holding so many folks and a bunch of sweaty sporty types you’d have thought the air-conditioning would have been a little bit more effective. All the competitions are taking place in the same room and this lends the event a really nice atmosphere. In the afternoons when most of the competitors are in there is a real buzz in the room. Of course the main event is the Championship itself in which the main contenders are GMs Adams, Short, Howell, Jones, Pert et al. It’s a strong line up. Grandmaster Andrew Martin is providing expert and excellent commentary on proceedings in the analysis room and I managed to pop in there for a while this afternoon to try and get my head around some of the action. Today was Round 8 and a real battle of the big beasts was in prospect as Nigel Short played Michael Adams and Gawain Jones played David Howell. The action was not disappointing for Short put Adams under huge pressure before finally having to concede a draw and Jones won very nicely against Howell. This leaves Short and Adams in co-lead on 6.5/8 and Jones, Nicholas Pert and Jonathan Hawkins just behind on 6. Then come Howell and Simon Ansell on 5.5 and a vast army on 5. Anyone interested in the games can replay Andrew Martin’s commentary or just look at the moves on the Championship website. So what of me? I’m taking part in two competitions this week. In the mornings I’m contesting the Under 160 Championship and in the afternoon taking part in an Open competition for all comers. Lets start with my progress in the U160 which is the one I probably have the best chance of performing well in. In yesterday’s first round I drew the third seed, Alexander Freeland, and played pretty well to win with Black in a King’s Gambit. I acceped it and found myself facing the Allgaier Gambit (where White puts his king’s knight on g5). After a couple of months without competative chess I could have done without such a sharp opening to be honest but it worked out ok in the end . I didn’t play the book line (which is to force White to sacrifice the knight on f7 early in the game) as I figured my opponent would be well prepared for that and instead gave back the gambit pawn and tried to develop as quickly as possible. Eventually my opponent forced off the queens and tried to defend an unfavorable ending but I managed to convert my advantage. Today’s round 2 draw me against the 5th seed and my club mate from Leeds Chess Club, Mark Szymanski. Mark is a top bloke and an excellent player but I nevertheless gave myself a chance with White against him. Normally I’d have expected him to opt for the Caro-Kann against 1.e4 but today, perhaps weary of my preparation, he elected to play the Scandinavian. I built up a good advantage in the opening with some accurate play but then threw it all away on move 13 with one careless move which provided him with counterplay. We fought on in a middle game in which he always had a slight edge and my king’s security was not great. Mark won two pawns in a queen and rook ending but then allowed me to swindle a draw from him just as victory seemed to be in his grasp. I was happy with a draw after a terrific see-saw game that I’ll be analysing for weeks. Peter Leggett. A friendly fellow. Monday’s round 1 draw of the Week 2 Afternoon Open was not kind to me as I drew the top seed with Black! Andrew Smith is a FIDE Master. Needless to say I wasn’t expecting to win the game but merely put up spirited resistance for as long as possible. In this endeavour I was not helped by his chice of opening, the off-beat Centre Game – 1.e4 e5 2.d4 exd4 3.Qxd4!? Nc6 4.Qe3. It only required a slightly inaccurate move order for me to hand him a positional advantage and after that it was pretty mich a forgone conclusion although I tried to go down fighting. Round 2 was this afternoon and I had a much easier task at hand in the form of Peter Leggett. The opening of this game was bizarre. I tried to lure him into a Four Knights Opening so that I could try a wild gambit that I fancied experimenting with. However it all took a strange turn and it took me quite a while to get anything going at all. In the end the closing stages were quite aesthetic. All four of my games so far can be seen in the viewer below. I haven’t had chance to add many notes yet but I hope readers will nevertheless find them interesting. It’s the premium event in the British chess calendar (ok we now have a super Grandmaster tournament to look forward to in December in London as well but that’s a bit different) and it just got started yesterday. The British Chess Championships are taking place down the M1 in Sheffield this year. The location couldn’t be much more enticing for Calderdale players and there will no doubt be several taking part in the host of different competitions. This year I list myself amongst their number. I won’t be travelling down until the second week as I’m playing in the Under 160 Championship and also in the afternoon open tournament taking place in week 2. I can’t wait! I have no idea how much opportunity I’ll get to watch the Championship itself but hopefully I will get a chance. The British Chess Federation has done a great job getting sponsorship in this year and that must have played a big part in enticing the strongest line up for years. The charge is led by reigning champion and British number 1, Michael Adams. He is joined by Nigel Short, David Howell, Gawain Jones and Nicholas Pert to complete the top five rated players but there are also another 6 Grandmasters competing. It should be a fantastic competition and if any of you are off work I highly recommend a day trip to Sheffield to catch one of the rounds as the atmosphere is always great. If you can’t make it to Sheffield then you can watch the top games (hopefully 14 boards) live here. The rounds start at 2.15pm everyday and finish on Friday the 5th with a rest day this Sunday. Whilst the top players scrap it out in the main event there will be hundreds of club level players fighting it out for the honours in a range of competitions for various standards of player and age group. This is where I’ll be next week. Hundreds of games will be contested. Usually many of these would go unnoticed and unloved accept by the players who played them. This year Hebden Bridge Chess Club would like to try and change all that by giving some of the plucky losers a chance to get their name in lights. You can find out more about these awards and see any entries that I receive over the two weeks on a new page that I’ve set up specifically for the purpose. It’s just a bit of fun but I hope we’ll get the chance to give some club level players at the Championships a bit of the limelight. If you know anyone who’s taking part over the next two weeks please let them know about this competition and help us celebrate the worst of British chess! Of course I’d like to think that none of my games will find their way onto this new page but somehow I figure that will be unlikely. I can guarantee readers that they won’t miss a beat though because during week 2 I will be posting a daily diary on these pages and publishing all my games, good or bad as well as my reflections on the rest of the goings on at Ponds Forge. I’ve also been building up a wealth of blog post material to publish in week 2 so there will be lots and lots of new content during the course of next week. Be sure to come back regularly for updates and entertainment as some of our columnists will be making appearances to help celebrate the championships. It should be fun.